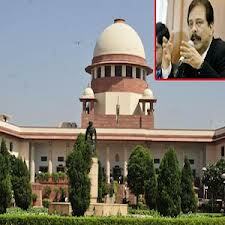 Supreme Court of India said that SEBI has failed in completing the Court’s order against the Sahara Group. Later August 31 Order of SC demanded Sahara Group to furnish all documents which are related to investments of more than 24,000-crore. The Sahara Group has failed to implement this order. The court further said that both SEBI and the Sahara firms could not have any mutual agreement to violate the August 31 judgment. Gopal Subramaniam, a counsel for Sahara Group reported to the bench of justice that the group is working out a schedule with the regulator to comply with the order by November 30. The bench of Justice K S Radhakrishnan and J S Khehar observed 10 days had been given to both Sahara India Real Estate Corporation Ltd (SIRECL) and Sahara Housing Investment Corporation Ltd (SHICL) to produce the documents. After this period of ten days SEBI was supposed to go ahead with its statutory duties to assure that genuine investors receive their money back. The court asked SEBI to go ahead with the actions. Arvind Datar, SEBI counsel and senior advocate, said that the order was not complied with. The bench pointed to the definite time limit of ten days given. Failing of this time period invited legal action from the side of SEBI. The court added that the Sahara Group had not been furnishing any document for many years. Still an extra of ten days was given to them for furnishing the documents. The court pointed to the fact that it was the duty of SEBI to comply with the judgment. The court further ordered SEBI to follow its statutory mandate and duty. On the other hand Mr. Subramaniam, the counsel for the Sahara Group informed the court that the documents were submitted in a DVD form to SEBI. Some of the documents contained arithmetical anomalies. Justifying the group Mr. Subramaniam said that they were rectifying these anomalies. The group is in constant consultation with SEBI. They seek all the ways on how to work out the modes and modalities for transportation of all documents which are related to their investments. Mr. Subramaniam expressed that the firm is trying hard to comply with the Court’s judgment. The group is working out a schedule for this. He added that the group strives to produce the original documents by November 30. The court cleared out that both the parties could not have a private deal. The court further asked SEBI to explain how these two – the market regulator and Sahara Group – could have a mutual agreement to have a violation of order. Apex Court added that not producing documents within 10 days is a violation of the judgment. Earlier on August 30, the SC had asked both the Sahara Group companies to refund an amount of 24,029– crore. This amount was collected in the period between 2008 and 2011 from nearly 2.96-crore investors. The court held SEBI was right in faulting SIRHEL and SHICL for the manner in which they had raised these huge funds. SIRECL collected over 19,400 crore from 2.21 crore investors through their open – ended scheme called OFCDs (Optionally Fully Convertible Debentures) in the period between 2008- April -25 to 2011- April- 13. The total collection of the company rose to 17,656 crore as on August 31, 2011. This collection was counted after meeting the demand for premature redemption. By issuing similar OFCDs, SHICL on the other hand too collected 6,380 crore from other investors. The court felt suspicion over many of these OFCD subscribers. The court felt many of them as fictitious. Thus the court ordered the Sahara Group to submit documents about its investors to SEBI within 10 days. It also allowed the regulator to engage investigators to probe the genuineness of these investors and the group’s claim that certain refunds were made. The court had said that if the claim of refund is found fake by the SEBI then the court will consider that as no refund has been made by the firm. Empowering SEBI further the court said that the SEBI will have the right to engage officers for investigating. This entry was posted in Real Estate News and tagged Real Estate, Sahara, SC’s August 31 order, SEBI by designer. Bookmark the permalink.